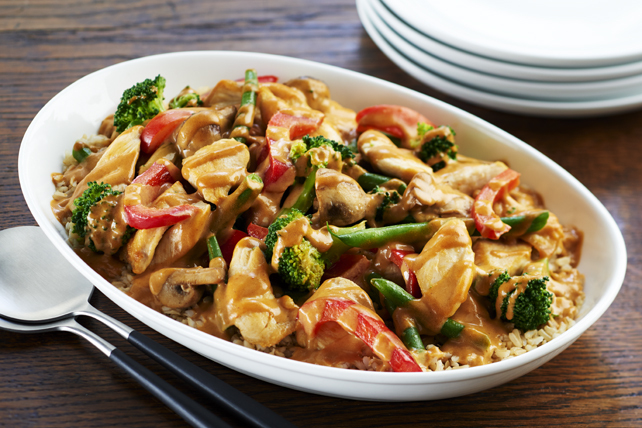 What could be better than your favourite Asian flavours coming together in one dish. This tasty recipe is a quick and easy alternative to takeout and sure to be a hit with your entire family. Cook rice as directed on package, omitting the salt. Meanwhile, cook next 5 ingredients in saucepan on low heat 3 min. or until heated through, stirring frequently. Keep warm. Stir-fry chicken in large skillet sprayed with cooking spray on medium-high heat 5 min. or until evenly browned. Add vegetables and 3 Tbsp. peanut butter sauce; stir-fry 5 min. or until chicken is done and all ingredients are heated through. Spoon rice onto platter; top with chicken mixture and remaining peanut butter sauce. For added colour and flavour, top with 2 sliced green onions before serving. If you prefer a milder sauce, omit the Sriracha sauce.